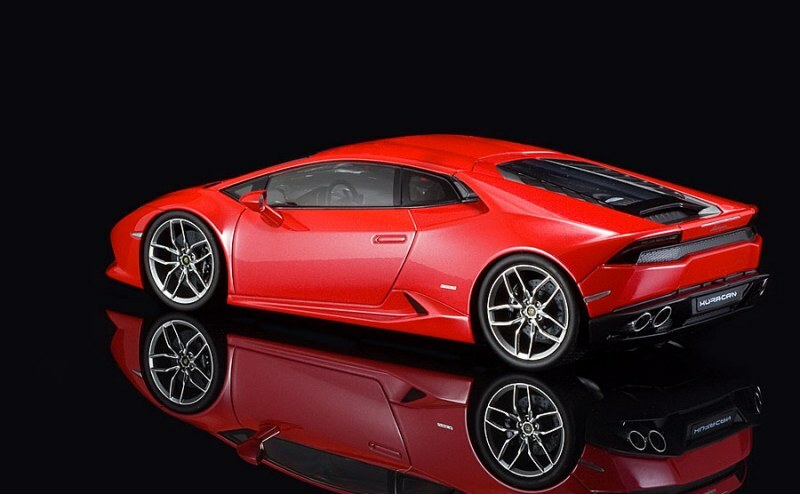 The Lamborghini Huracan LP610-4 was introduced at the 2014 Geneva Auto Show. 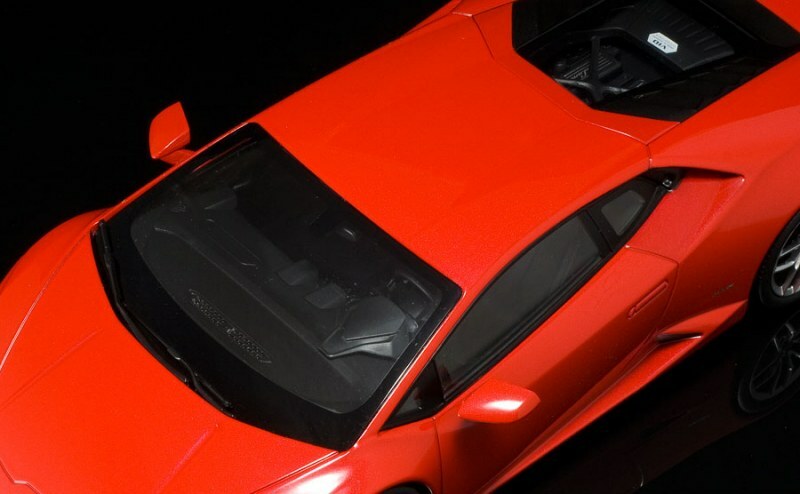 Even before this new V10 was unveiled to the public, the order book was filled because Lamborghini decided to have a series of VIP invitation-only unveils all over the world in the months ahead of the Geneva show. The successor to the Gallardo was already a sales hit before most of us even saw it. 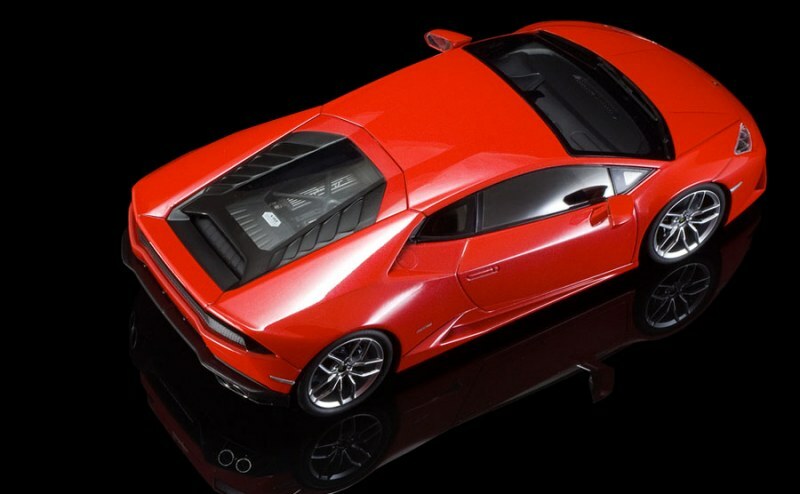 Naturally, one of the first to have a 1:18 scale model of the Lamborghini Huracan was MR, but this time, Lamborghini already had 1:18 diecast models for sale right at the Geneva show when the real car was on the stand. Bburago managed to have no less than four shades available right from the start, white metallic, green metallic, silver metallic and naturally yellow metallic. 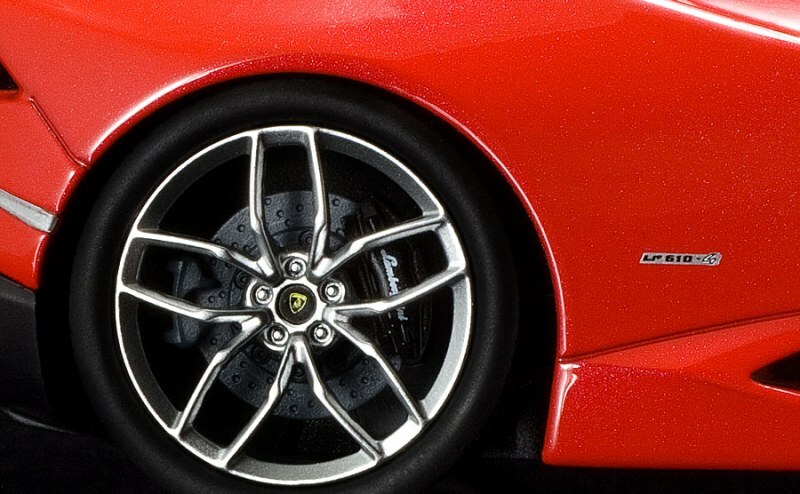 By now, we have confirmation that AUTOArt will be releasing several shades of the Lamborghini Huracan LP610-4 too in the near future, but Kyosho beat them to it by releasing two shades in their sealed diecast Ousia series, yellow metallic and this amazing Rosso Mars – a red metallic shade that is rather popular on the real Huracan. Let’s get the first hurdle for many collectors out the way here. No, nothing opens on this 1:18 Kyosho model, just like on an MR, in fact, which happens to be about five times more expensive, just so you understand this before you buy a Kyosho Ousia model. They don’t open, period. I, for one, don’t really have a big issue with that fact, since I have most of my cars on display with the doors and hoods closed anyway. 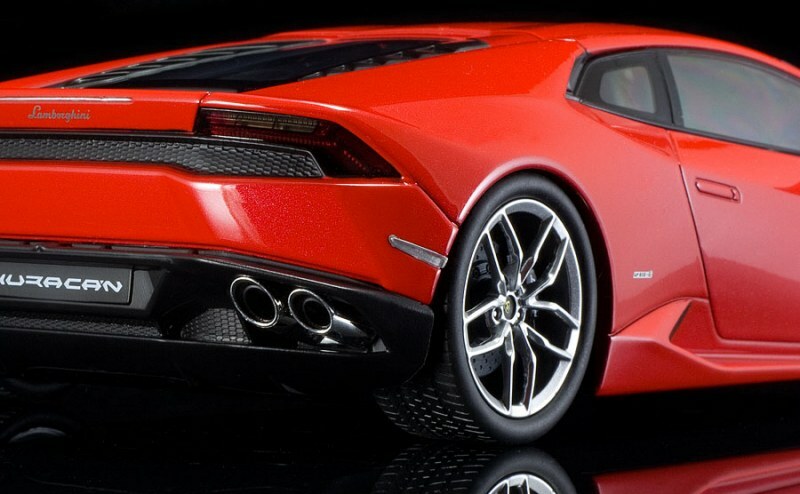 Sure, it looks nice to have the doors open, or to admire the engine up close, but in the end I put them on display all closed up usually, and I have to say this Rosso Mars Lamborghini Huracan from Kyosho has an amazing ‘shelf presence’! 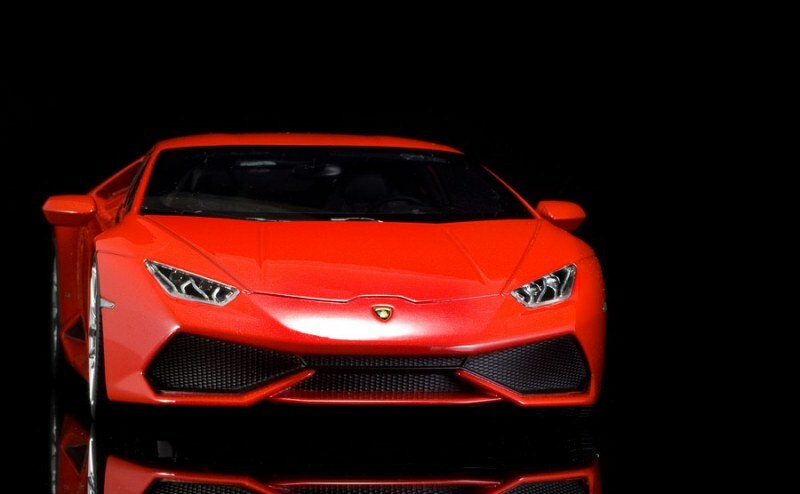 I usually am not a fan of bright red paint on modern Lamborghini, I love it on the Miura, Countach and Diablo, but on the Murcielago and the Aventador, I just don’t feel it suits the car. Even on the Gallardo, it doesn’t really impress me. I have the Rosso Mars Gallardo LP570-4 Super Trofeo Stradale, but I also have that one in white. I got the red one because it was unveiled in that shade and it was featured like that in the press release. I really like the white STS, the red one comes with the optional black roof which the white one lacks. Back to this Kyosho-made Huracan in Rosso Mars. It looks amazing, the metallic sparkle in the paint is very nicely done by Kyosho. It did come with a few spots and smudges straight from the box (I actually think the seller used this one to take his own photos, not sure about that, but I got that feeling because some fingerprints were on it – not normal for a brand new model), but a little wax and buffing brought out an amazing shine all over this model. If you are in doubt which shade to get, this Rosso Mars should be high on your list, it is beautiful! Kyosho went for the optional, lightweight Mimas wheels on their model. It is nice to have a different wheel to the Bburago models (they have the standard Giano wheels) I already owned. 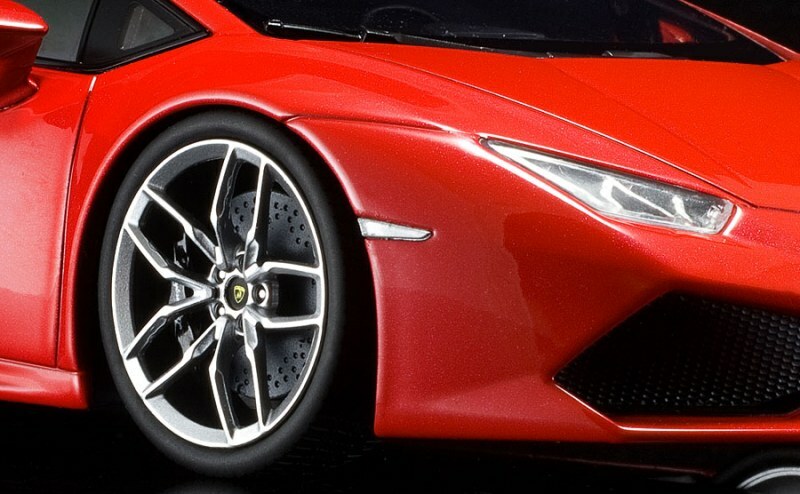 Sadly, Kyosho didn’t go for color coded brake calipers, since both their Rosso Mars and their Giallo Taurus come with black calipers, which on the Huracan are an option. In fact, she comes with silver brake calipers as standard fitment. The Kyosho model is in fact a LHD Euro-spec model, the side lights are white on both red and yellow cars. If these would be orange up front and red at the back, we would be looking at a US-spec version. A small detail, but still important for those owners in the United States that would like a scale model of their real car. 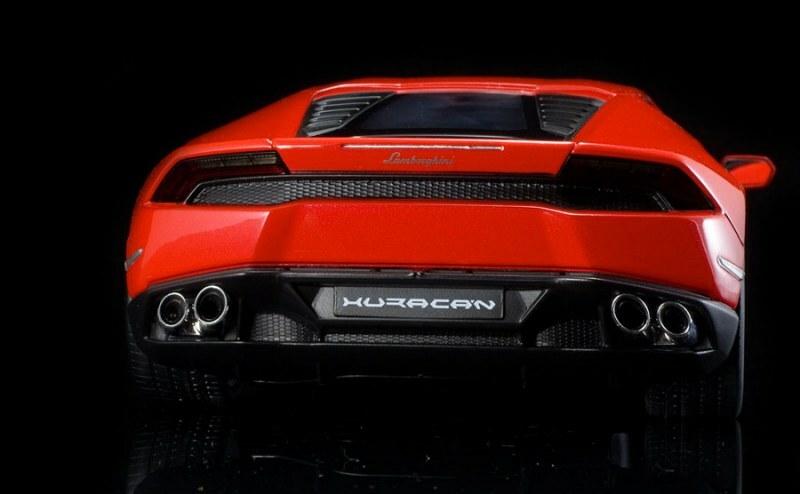 Talking about lights, the Kyosho headlights on this Lamborghini Huracan are surely better than those seen on the Bburago, but they still don’t really look too convincing. I think those typical Y-shaped driving lights could have been executed a little better. Same with the taillights – sure, they have red and orange in them for the turn signals, but they are a shade too dark to be visible. I know the real car looks to have black taillights too, so I think Kyosho wanted to mimic that look when they designed the rear. While we’re at the rear, let’s take a closer look at the glass engine cover, which is an option in real life. 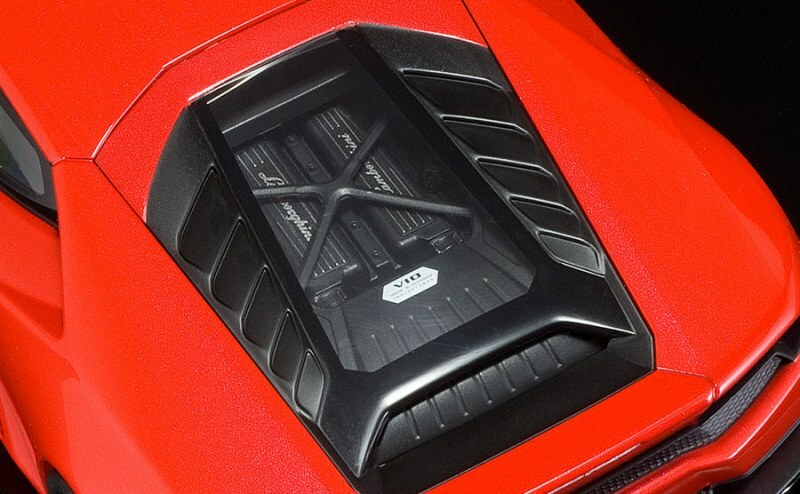 Kyosho made an error here: when you opt for the glass engine cover on your real Lamborghini Huracan, you also get the Forged Composite engine surround and exhaust cover. Kyosho just used black plastic without any Forged Composite look alike. To be honest, the engine detail is poor. Very poor, in fact. If you aren’t going to put any effort into getting the engine to look good, why would you go for the glass engine cover option on your scale model. Kyosho should have gone for the standard, louvred engine cover so you don’t see the engine. This is a let down on this model in my book, sorry. On the other hand, the quad exhausts look really nice, they even show the ‘double barrel’ design, as seen on the real car. This is a very nice detail Kyosho got perfectly right on their 1:18 model. The fact that this is a scale model with sealed grilles is another thing to keep in mind, if you are thinking about buying it. At the moment, the Kyosho Ousia sealed diecast models come with closed grilles, just like Bburago, but Bburago are half the price, mind you, and they do have opening doors and hoods. I did hear Kyosho will have photo etched grilles on upcoming Ousia models. One thing I really did find rather disturbing was that triangular air intake in front of the rear wheels … Kyosho didn’t even bother to put a grille in there. Instead, that intake is just a black painted triangle. Sure, it doesn’t show too much when you admire the car in a display case, but it would have been a much nicer touch if Kyosho put a sealed grille in that opening too. A small detail, but when buying scale models like this, it is all about the details. 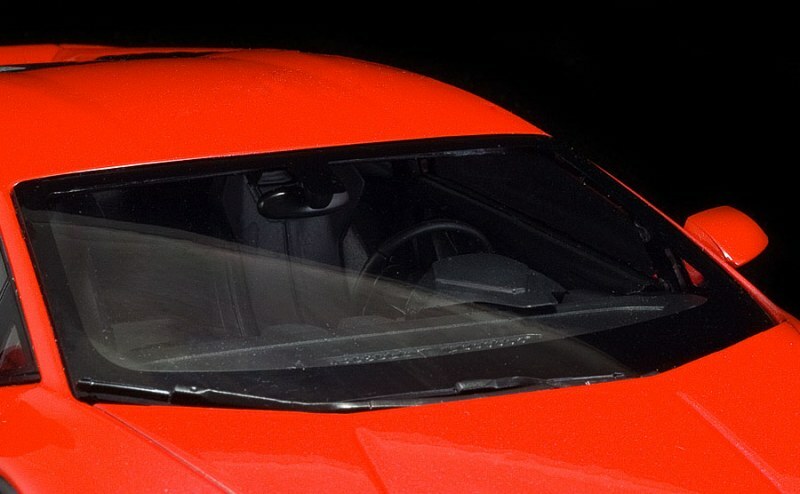 Another detail – take a look at the air intake behind the side window, where there should be a flat intake on the bodywork. Kyosho didn’t even paint it black, it just isn’t there – a serious lack of attention to detail. The interior of this Kyosho Lamborghini Huracan does look nicely detailed, a little sad they didn’t go for a two tone interior. I’m sure a red and black combination would look really amazing inside the Rosso Mars body, but other than that the seats and dashboard look really nice in their black finish. If you look at this 1:18 model in her display case, the overall impression is, in fact, very good. The stance of this model is spot on, the wheels fill the arches nicely and the thin tires look nice; no Pirelli script on them, but that is usual on other 1:18 models too, so nothing to worry about. Despite a few flaws mentioned earlier, I really like this Rosso Mars metallic red Lamborghini Huracan LP610-4 by Kyosho. The sparkle of the paint is really very nicely done, the wheels and brakes look right, the stance is amazing and she just displays so well between my other 1/18 scale models. This one is a very nice alternative to the cheaper Bburago model. 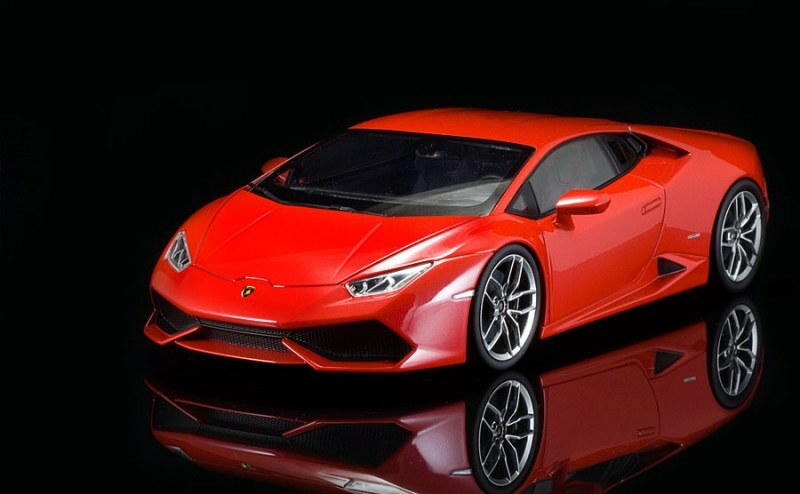 1 Response to "REVIEW: Kyosho Lamborghini Huracan LP610-4"
I have the 2015 Lamborghini Huracan. It’s Black (not matte) with red calipers and black and red seats. It also has the chrome colored rims. Can you locate the die cast model for me?